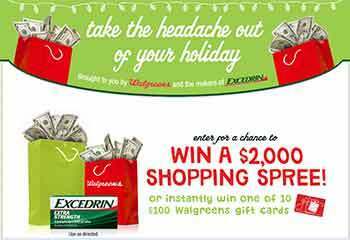 www.ExcedrinSweeps.com – Walgreens Excedrin Holiday Sweepstakes. Shopping Spree Sweepstakes! How would you like to win some extra cash for your Holiday Shopping? If I tell you that you can do your holiday shopping for free by winning $2,000 or one of ten $100 prizes from Walgreens and Excedrin’s Holiday Sweepstakes. Sound interesting! 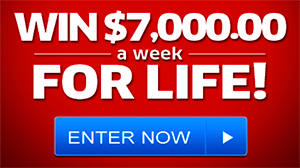 Well, you might take a look at Walgreens sweepstakes promotion website at ExcedrinSweeps.com. Indeed, Novartis Consumer Health, Inc the Pharmaceutical Company behind many health products among other the well known “Excedrin”; They are sponsoring this marketing promotion in collaboration with Walgreen’s Company offering you the chance to win a cash prize of $2,000. You may visit today their official sweepstakes website at ExcedrinSweeps.com and follow the on-screen instructions to enter the contest. Limit of one (1) registration per person/email address throughout the Promotion Period. Grand Prize: $2,000 cash that you can use for a shopping spree. Instant Prizes (10): $100 cash. Total ARV of all prizes available to be won: USD $3,000.00. My name is Angeliner in i really can use a shopping spree i am in need my children in need so pch make it happen this holiday i have no money too buy my children and me something.